Legacy Fighting Alliance headed back to the Land of 10,000 Lakes for a brutal night of fights. The fight went down at the Mystic Lake Showroom in Prior Lake, Minnesota. 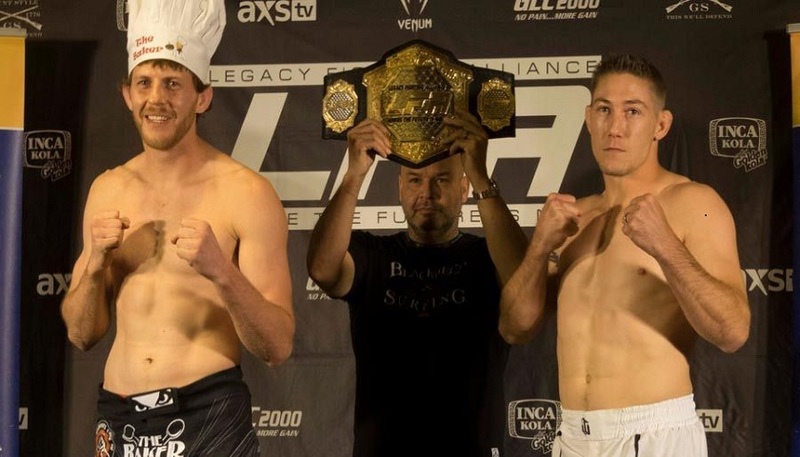 Derrick “D-Rock” Krantz (19-9) and Ben “The Baker” Neumann (12-4) went to war for the inaugural Legacy Fighting Alliance Welterweight title tonight in the main event. Both men have already achieved a win inside the LFA cage and have experience in both the RFA and Legacy Fights cages as well. This was one main event that was sure to entertain and once it’s all over, someone went home with a brand new belt! The winner ended up being Derrick Krantz via second round TKO. The co-main event tonight featured Chase Waldon (10-2) vs. LFA newcomer, Cully “The Mason” Butterfield (14-5). Waldon came into this fight as the #2 ranked Middleweight on the AXS TV Fights Rankings and was previously the RFA Middleweight title challenger. Butterfield had a total of 7 wins by TKO/KO and holds a blue belt in BJJ. This fight would go to a split decision.